*At the times of these reports, the complete set of data was not available for Sweden or Slovakia, so both have been excluded from this report. Sure, the top of the list may come as unsurprising when you rank the countries by annual tourist visitors. France leads with 84.5 million tourists in 2015, followed by Spain (68.5 million) and Italy (50.7 million). 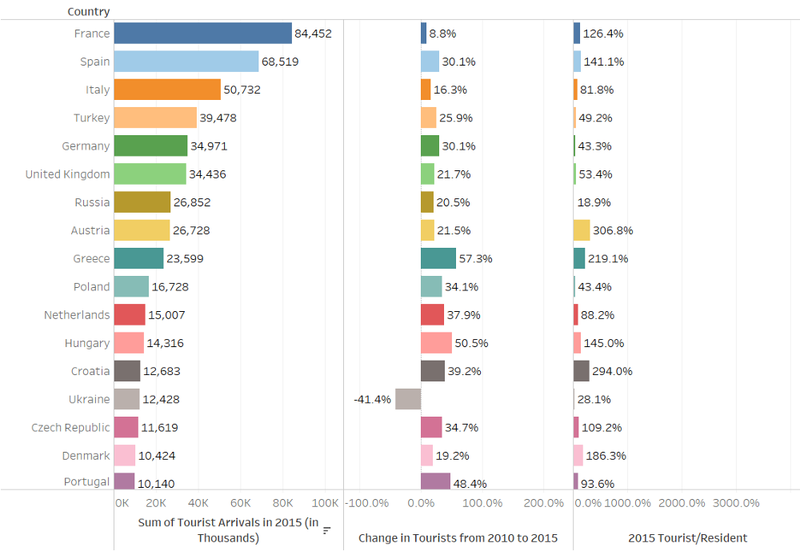 But as you look to the change of tourists from 2010 to 2015, you’ll see that these top tourism countries differ greatly in their rate of tourism growth. From 2010 to 2015, France’s tourism numbers only gained 8.8%, the lowest among countries in the top 10 for overall tourism arrivals. Greece, on the other hand, led the top 10 with an impressive 57.3% growth in tourism. 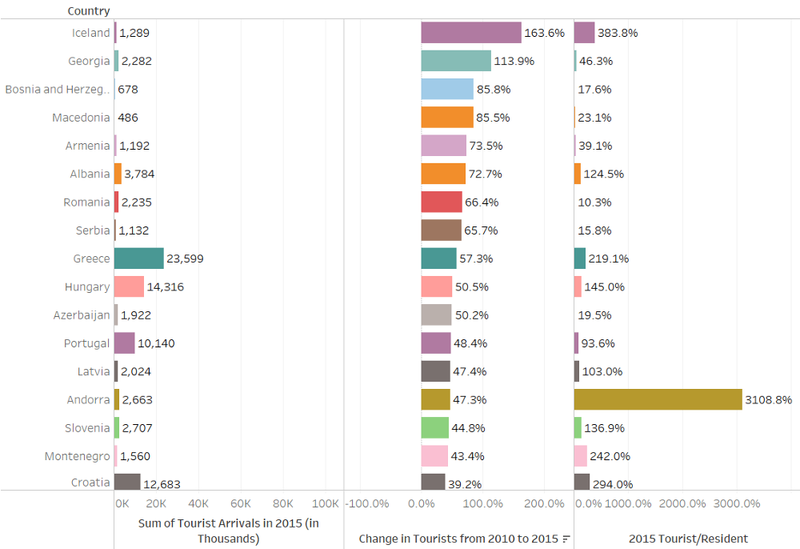 Something to note here too is not only are major tourism powerhouses like France already overflowing with annual visitors, they already make up more of the population that residents. In France, the 84.5 million visitors in 2015 surpassed the local population by 26.4%. In Spain, it’s even worse with tourists outnumbering locals by 41.1% (yet Spain’s tourism growth rate is over three times as large as in France). No country, however, beats out Austria, whose ratio of tourists to residents is an incredible 306.8%. When it comes to trendy countries, there’s not much in the world trending up more than Iceland. If France is Starbucks, then Iceland is Philz Coffee (offense intended, France). Over five years, Iceland’s tourist visitors have risen 163.6%. The 1.3 million international tourists that came in exceeded the local Icelandic population by 284%. The above map depicts each country colored based on the proportion of international tourist arrivals to actual residents. Colors in darker shades of green indicate countries with a lower proportion of tourists while countries shaded in darker red indicate countries with greater proportions of tourists to residents. Lighter shades indicate a near-even proportion of residents and tourists. 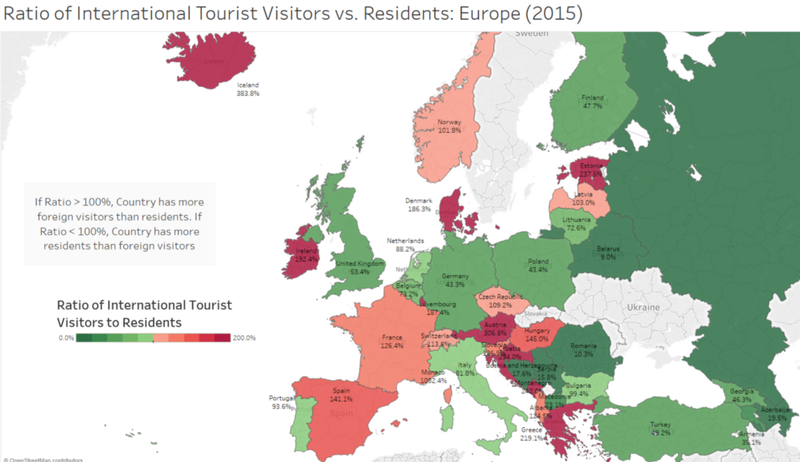 I’ve seen five European countries in the last year (Italy, Switzerland, Hungary, Spain, and Norway), there’s no way I would have guessed that Italy had the lowest ratio of tourists to locals (81.8%), I mean it was crawling with tourists in late-October. Truth be told, I would have bet on Hungary (145%), but on recent thought, I realize that while I noticed a complete absence of American tourists in Budapest, there was no doubt a significant presence of Eastern European visitors that I recall. Of the major countries, it surprised me to see Germany resting in the green with a 43% tourist/resident ratio despite sharing its southern border with the likes of Luxembourg (187%), France (126%), Switzerland (114%), Austria (307%), and Czech Republic (109%). 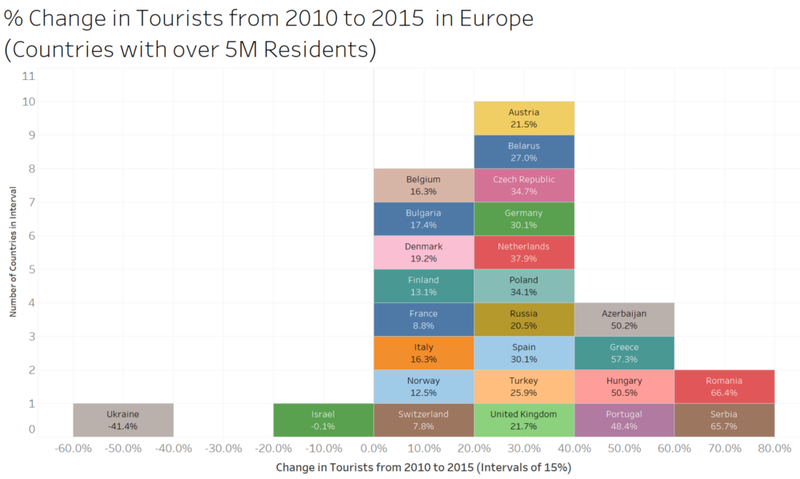 When looking at all European countries with over 5 million residents, nearly every country is growing in tourist visitors by a sizeable margin. 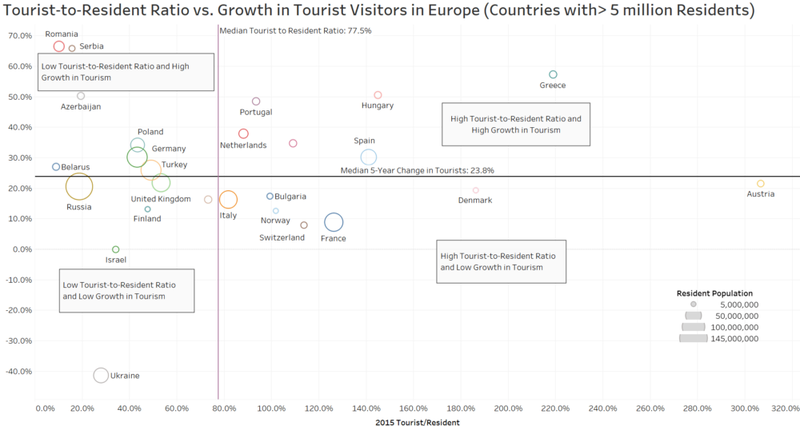 When analyzing the change in tourist visitors over a five-year span (breaking the countries into groups of 20% intervals), the most countries are growing in the 20–40% bracket, and is narrowly followed by countries with relatively low growth (<20% growth in tourism). Finally, to combine the two factors, here is a quadrant map just looking at countries with over 5 million residents. Along the x-axis is the tourist-to-resident ratio, along the y-axis is the 5-year change in tourist arrivals, and the size of the circles indicate the size of the resident population of the respective countries. Low Tourist-to-Resident Ratio & Low Growth in TourismThese areas are in prime condition and aren’t rising considerably fast.While countries on this list such as Russia, Ukraine, and Finland make a certain degree of sense due to their geographic location or various other travel limitations, I was caught off-guard to see the UK among this list. High Tourist-to-Resident Ratio & High Growth in TourismThese areas are already present with a high saturation of tourists, and it ain’t slowing down either. Way out there in the far upper right is Greece. Chasing Greece is Hungary, Spain, Czech Republic, and the Netherlands.Despite all my pride of venturing into (relatively) lesser-visited domains such as Hungary, it does fall into this category, meaning I’m a much less trendy traveler than I thought. Low Tourist-to-Resident Ratio & High Growth in TourismThese countries remain under-visited by international travelers, but time is running out on these beauties. At the far left of the grid is Romania, with a Tourist/Resident ratio of only 10%, but it’s also rising in popularity. Surely the more affordable pricing and expansion of travel interests in contributing to a boom in the Eastern-European country of over 65% in just a five-year period. Also included in this segment is Germany, Turkey, and Poland. High Tourist-to-Resident Ratio & Low Growth in TourismWhile these countries may have already reached the point of no return, the silver lining is they aren’t growing at a rapid pace. Tourism A-listers such as France and Italy headline this list, but also smaller countries such Norway, Switzerland, and Austria make this list. Thank you for reading my latest data post. As a product marketing and data analytics professional, I have a passion for data-backed storytelling. These data journalism posts are my way of integrating real data with my personal diverse interests, which include anything from travel and entertainment to economic and societal issues.